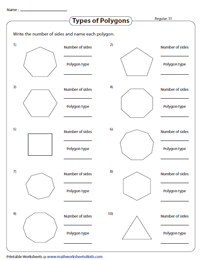 The main objective of this array of classifying polygons worksheets is to assist children of grade 2 through grade 7, to distinguish between the types of polygons such as regular, irregular, concave, convex, simple and complex. Learn to name the polygons by counting the sides and use the regular polygons chart for a vivid understanding. Enhance your practice by working out the revision worksheets. Comprehend the difference between regular and irregular polygons and learn to categorize them. Label the polygons with equal sides and angles as regular or congruent polygons and the others as irregular. 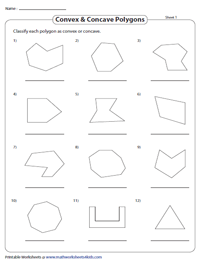 Distinguish between convex and concave polygons and label them in this set of worksheets. Polygons with every internal angle measuring <180º are convex polygons and those with at least one internal angle measuring >180º are concave polygons. The sides of a simple polygon do not intersect, while the sides of a complex polygon cross over each other one or more times. 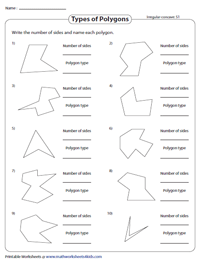 Classify the polygons as simple or complex by observing their sides in this set of 6th and 7th grade classifying polygon worksheets. 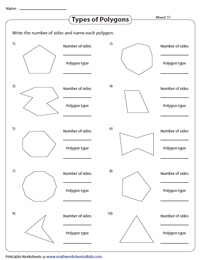 Count the number of sides in each polygon featured in the naming polygons worksheets. Write the names of the polygons based on the number of sides. Recommended for second and third grade children. 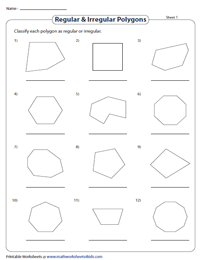 Bolster identification and naming skills with this batch of polygon worksheets comprising 10 irregular convex polygons each. Count the number of sides ranging from 3 to 10 and name them accordingly. 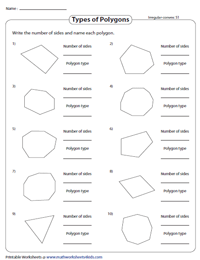 Employ this set of worksheets to add-on to your practice in identification of irregular concave polygons. The number of sides determines the name of the polygon, count the sides and name the polygons. 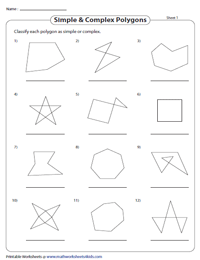 Recapitulate the concept of naming polygons with this batch of mixed review worksheets. Find polygons such as regular, irregular convex and irregular concave. Prefix the word '-gon' with the number of sides to name the polygons with more than four sides.